Its no secret. I love Indie Patterns and I love supporting them. Unfortunately not all the styles work for everybody and my first foray into wrap dress sewing (Vogue 8379) convinced me that it wasn’t the style for me. It made me look frumpy! I gave up on this style. Until.. I made the faux wrap dress – Wren from Colette. And that was a game changer. I Loved this dress on me! That also led me to the conclusion that its the skirt which needs to be fitted. So when this lovely gift from Elliot Berman Fabrics arrived at my doorstep the other day, it completely brought me out of my sewing slump and I decided to make a “Real” (as in with ties and such…) Wrap Dress. And here it is! Now based on the numerous reviews on Patternreview, I did make a few changes. But the best advice I got was from Sara Cormeny on Facebook, to add contrast ties and band. I knew I wanted to tweak the pattern anyway to add wide neckband. To use the same fabric for ties, was a brilliant idea! Thanks Sara! It breaks up the print and frames it. I absolutely love it. It is still too revealing for me without a camisole! But whatever. So this is how I added the bands. 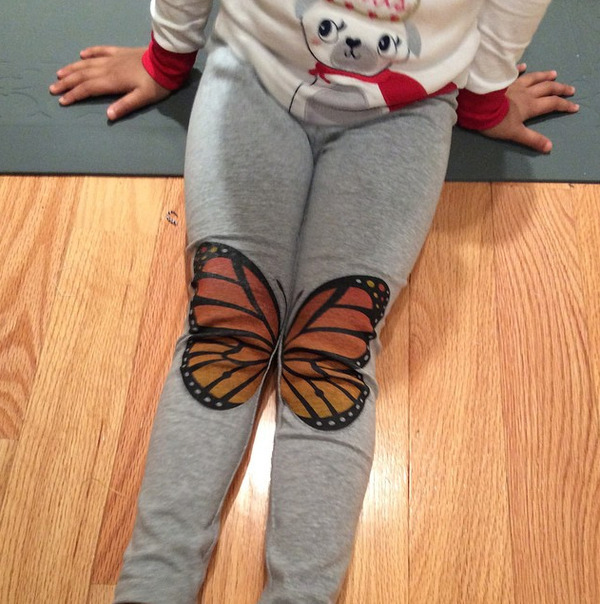 I tapered them down to the end for some added interest. After serging them on to the neckline (while stretching the bands slightly), I folded the ends in for a clean look. The photo explains it better. Then I simply added the ties to the end and we’re done! Here’s a better look at the bodice on the dressform. Yes, I know that its left over right but I was just shooting it so its ok. I took Lea for a test drive yesterday at the PR meetup and loved walking in it. While it does not open up too much. I will feel much better if I add about 5″ to the underlap. I’ll do that and an FBA in my next version. The ties are too long as is! I will most certainly cut them down to half next time. But overall I am so pleased with my dress. We all have our idea of what an act of True Love is. To some it means a fancy dinner, for others it could be a home cooked meal. While some enjoy their true love’s company at a resort, others may squeal in delight at an unexpected bouquet of flowers on a Wednesday evening. But what about those things your love does for you which may seem insignificant to others but you know in your heart how much you are loved when he/she sets you free? Free as in “do what you love and I’ll even take you there“. Back in 2002 Gagan and I took a trip to Philadelphia because I wanted to attend the ASG conference. On the way there, when I asked to stop at Threads HQ, he did and I got a personalized tour of the #1 sewing magazine. I don’t have pictures from that trip but I don’t need them because its etched in my memory forever. 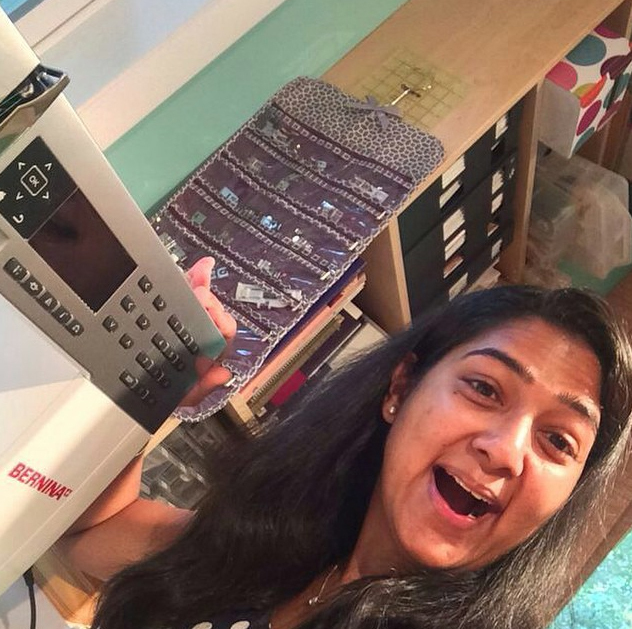 So while I enjoyed my first ever sewing conference, Gagan spent his day at Startbucks working. And when I got back, he was even excited to hear about my day. It still brings a smile to my face whenever I think of that time. Yes, its true love which makes you do things like this. I totally refused saying that I didn’t need it. But guess what? 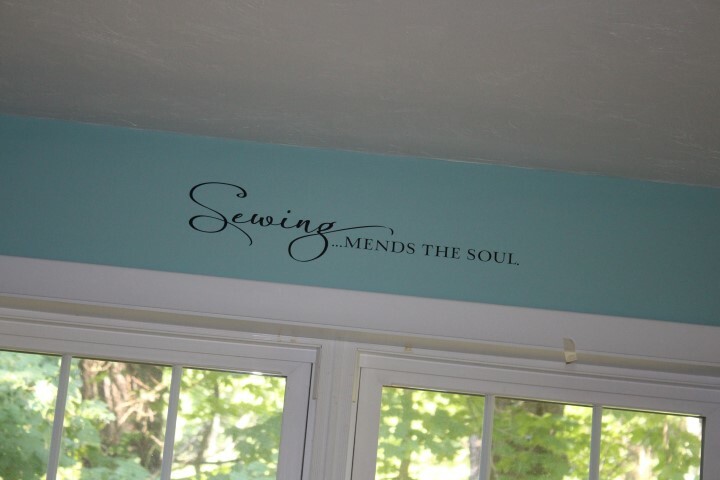 He went ahead and did it anyway 🙂 So yes, this post is about my sewing studio, my happy place. A place where I go in and feel inspired to CREATE. When I enter this room, I smile. 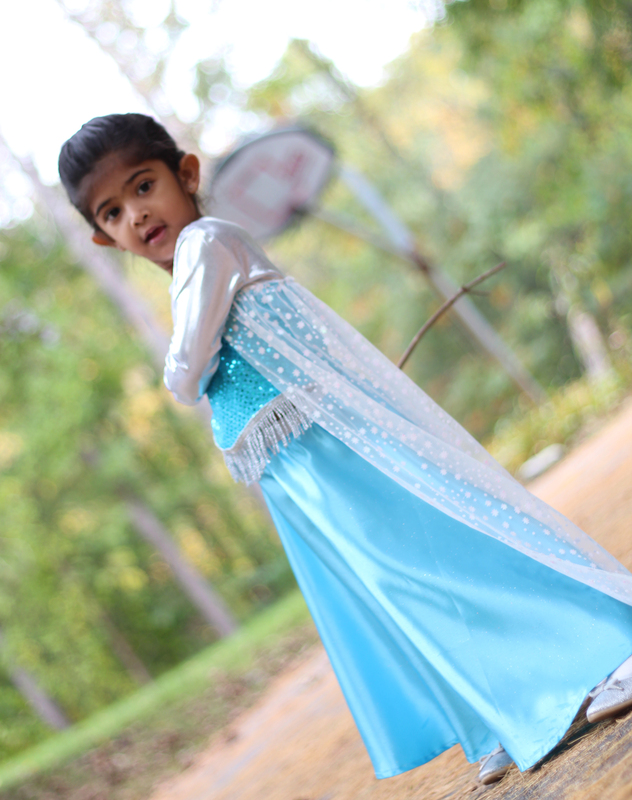 And Gagan did that for me. And if that’s not true love, I don’t know what is? 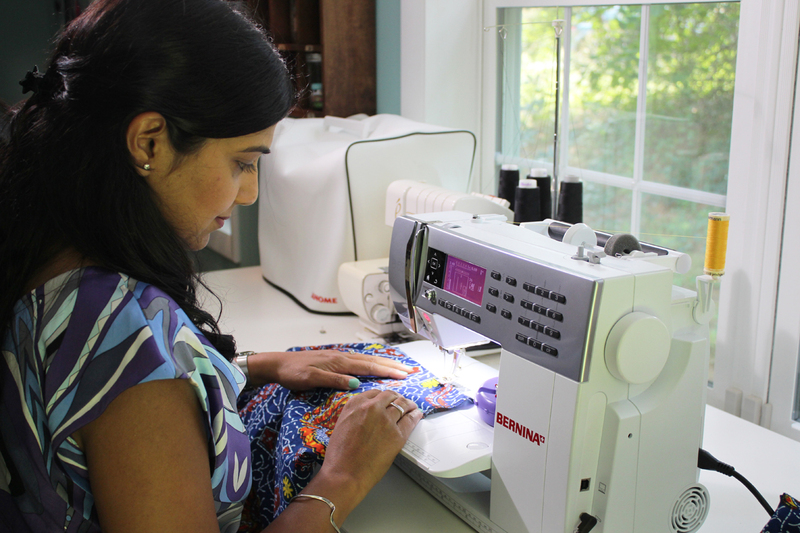 It took me 5 years to write this post about my sewing room because it has been a work in progress since then. 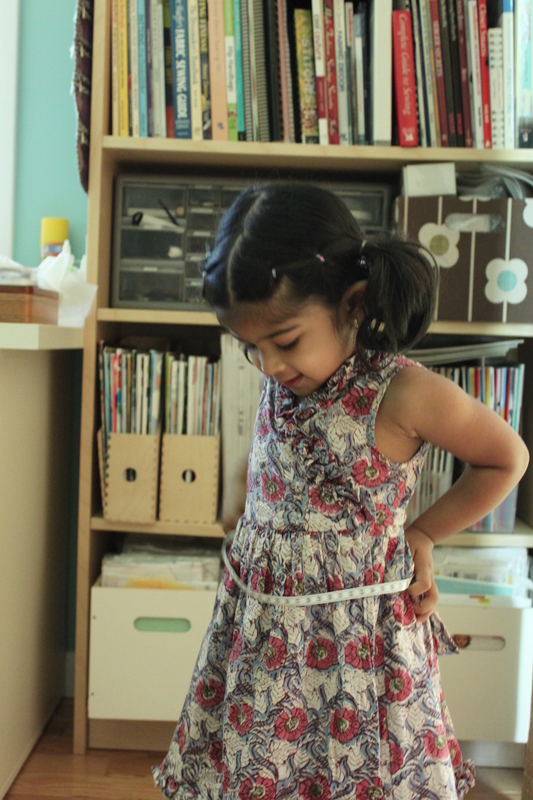 I have been organizing it, collecting furniture for it, setting it the way which makes more sense with a little one around so she can use it too. It has been a labor of love for me and I’ve loved every minute of it. 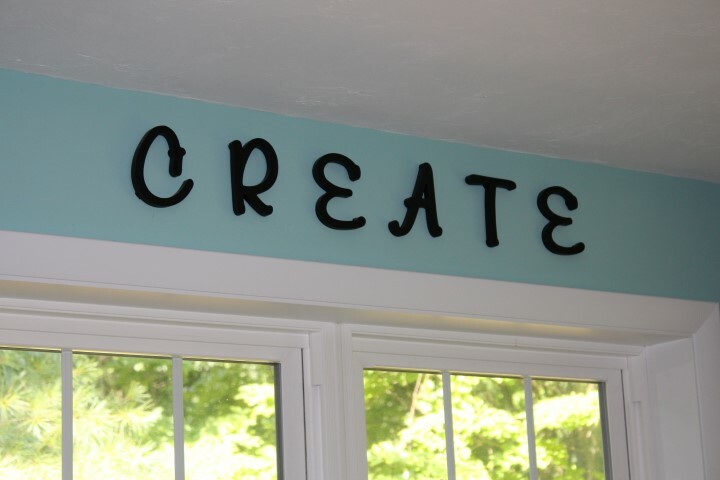 I feel lucky and blessed to have this space to create and it gives me pleasure to share it with you, in the hope that maybe it’ll give you some ideas for your own space, whether its a shared or a dedicated space. 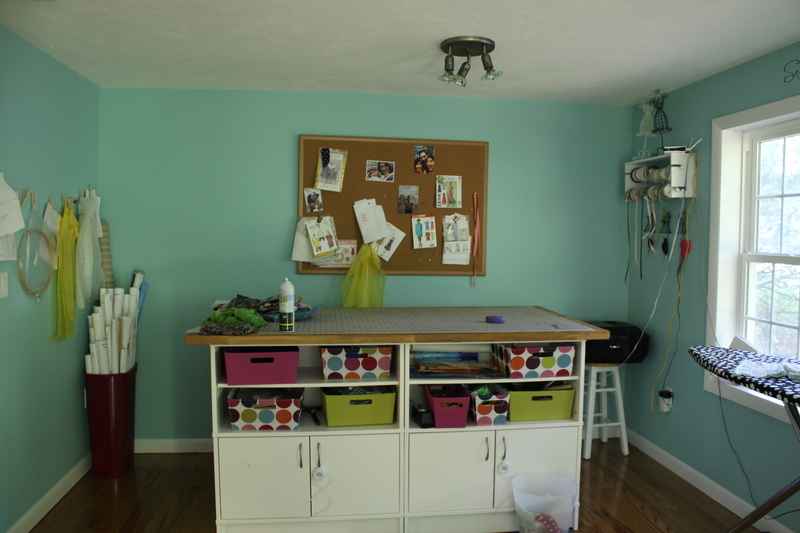 My biggest advice to you when you are thinking of setting up your sewing space is to not feel that you have to do it in one day. Mine took 5 years! Depending on your life and your budget, start with the essentials and keep adding slowly. Its more fun and enjoyable this way. So lets start with the tour shall we? I picked this really vibrant color (I’ll have to find the exact shade but I think its called Waterfall – Benjamin Moore) because it makes me happy. Everything pops against this color and the white trim keeps it super bright and fresh. 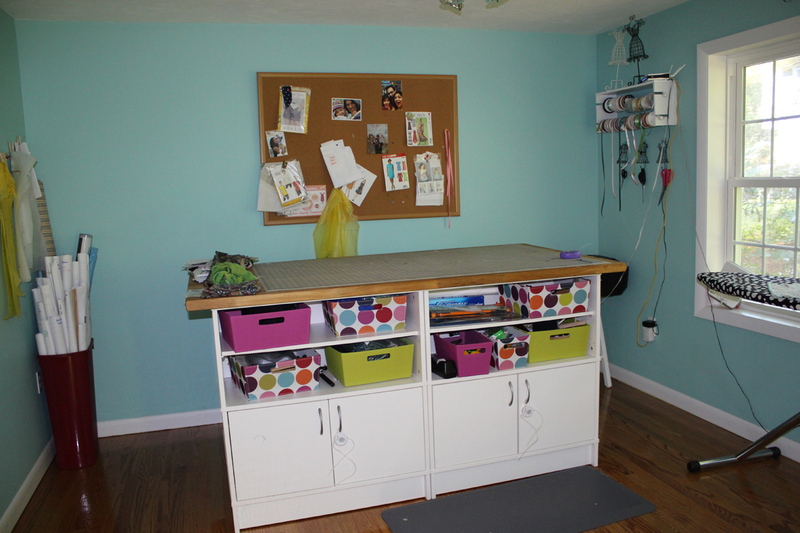 Without doubt the focal point of this room is the cutting table with lots of storage under it. I can’t take credit for it. On our trip to IKEA we saw a room set up as a “sewing room” and I love the idea of using kitchen butcher block tabletop with 4 cabinets under it which have storage. 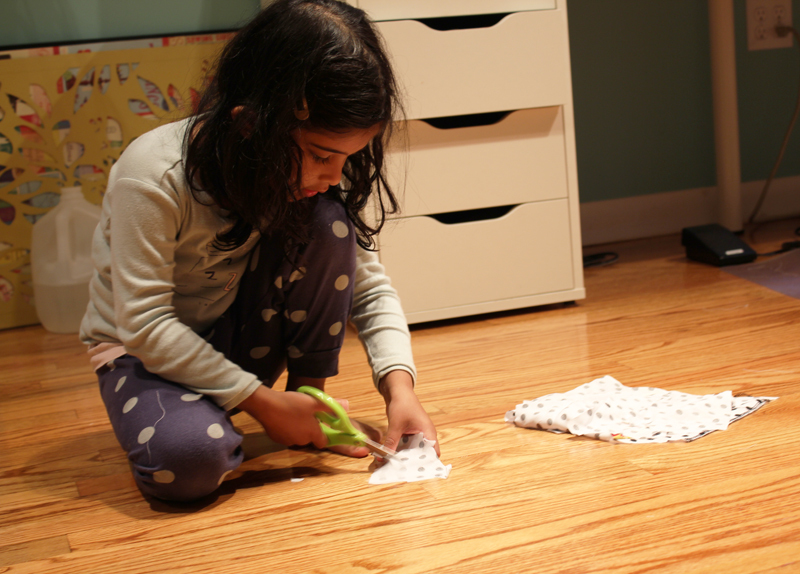 I could envision lots of time being spent on this table doing crafts, homework with Dia and of course cutting fabric. A solid butcher block meant this piece is virtually indestructible. The bad part, you can’t move it. The cabinets are screwed together and then the tabletop is placed on top and also secured with heavy duty screws. Since this room has no storage I was grateful for the cabinets under the table to store things. My in-progress pattern pieces or the patterns I am currently tweaking or working on go up on the wall to the left of the cutting table. 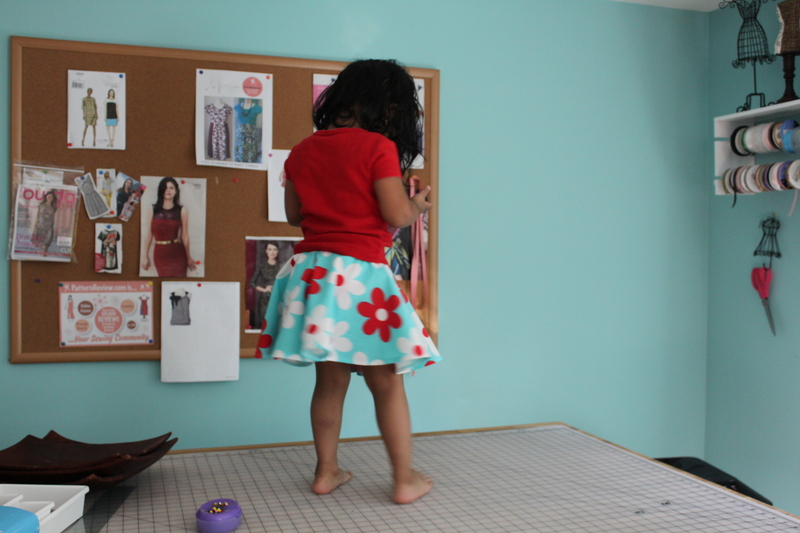 And of course the bulletin board is a constant source of inspiration for whats coming next. I pin patterns and swatches of fabrics for the projects which I am going to make next and somehow I still don’t follow the plan. I’ve dedicated a cabinet for my jewelry making endeavors, other to knitting. One holds the leather and interfacing the final cabinet holds paper crafts. Yes I am a woman of 1000 hobbies. But isn’t it nice that its all in one place? The sewing table is pretty basic ALEX tabletop from IKEA with two cabinets on either side. 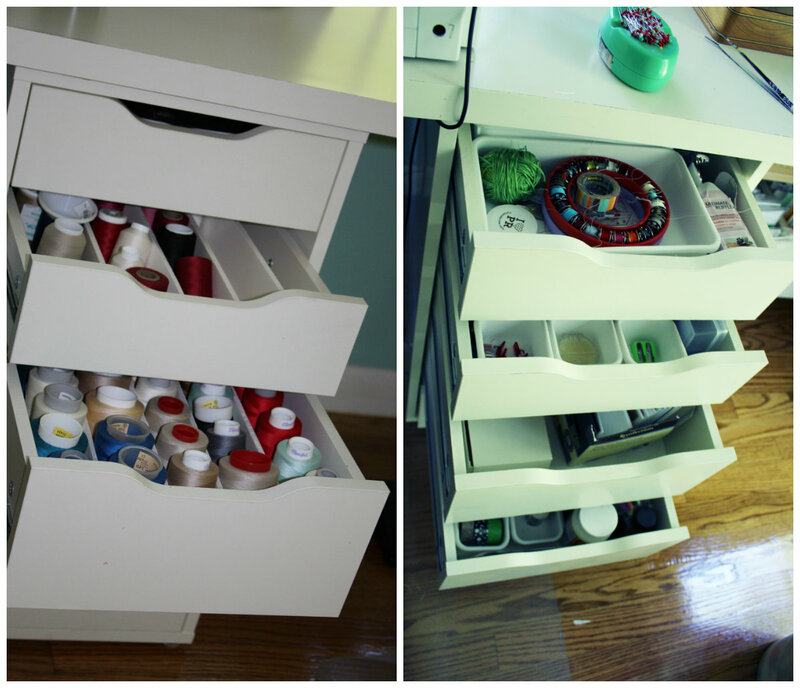 The left side holds serger thread, sewing machine manuals etc and the right side drawers have sewing stuff and notions and what not. The last two drawers are for paints and stamps. For my serger thread, I cut pieces of foam core and made dividers for the drawers. Easy Peasy! The Billy bookcase is indispensable for the amount of stuff which lives here and it also utilizes vertical space so its a win win. Threads magazines, Jalie patterns, elastics, zippers and other random stuff goes in the top shelves and the heaviest – Patterns are in the bottom shelf. The boxes are also from ikea and are perfect size for the paper envelopes. Of course now I am struggling with where to keep my digital patterns which when printed on heavy paper take up a lot more room. Right now they are rolled up in a wrapping paper bin which you can see in the first photo. It works for now. I picked up this letterpress tray at a thrift store, cleaned and sanded it and then stained it to a dark color. Gagan helped me mount it to the brick wall. 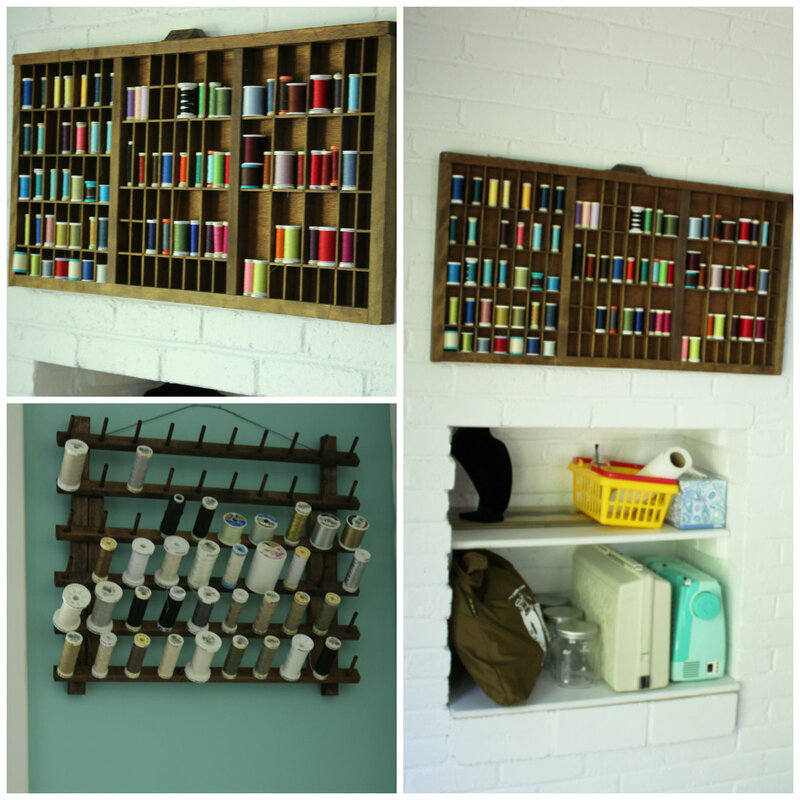 I was running out of space for thread so later I stained the June Tailor thread rack to match this tray. I keep my neutral threads on this rack. 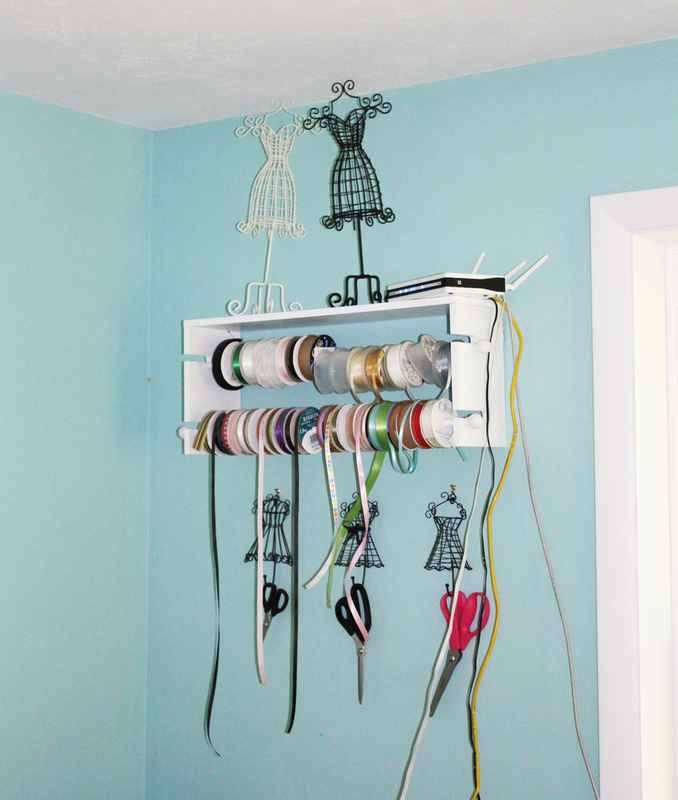 I found this ribbon rack at Michaels and it was perfect for keeping the ribbon spools organized. It looks pretty too. 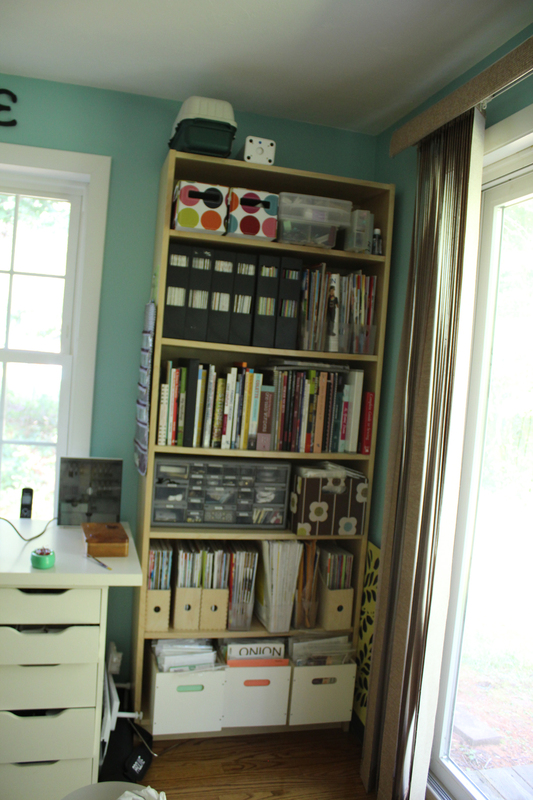 This Cubby is probably my second favorite piece in this room (The Cutting table is the first) in this room. I contemplated for a long time before buying it because you know Pottery Barn… but I really couldn’t find anything else. I even looked up how to make it myself (who am I kidding? ) but in the end decided to buy it at thanksgiving sale last year and I’ve loved it since then! 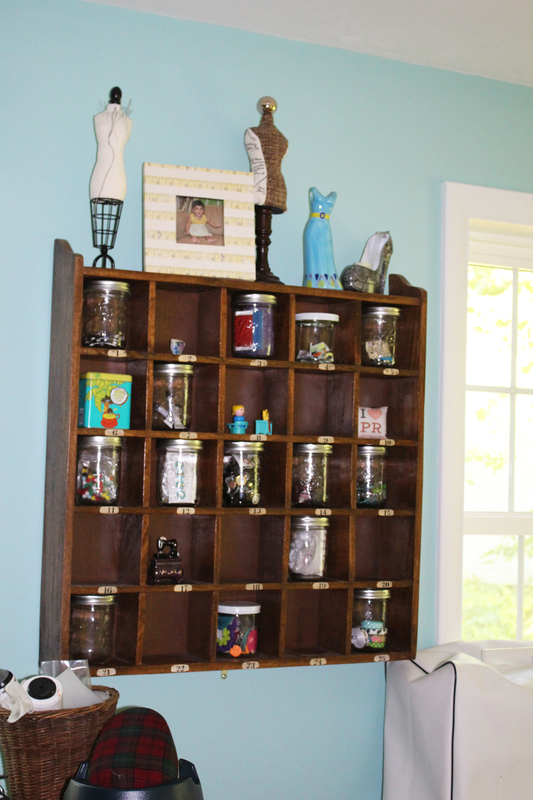 I keep my buttons, snaps and other decorative items here. So there is this small alcove between the firepit and the wall. I decided this was where my stash was going to go. It looks small but is very deep. I got these wire shelves cut to size from home depot and mounted them. Put a tension rod up and added a simple curtain from IKEA and called it a day. So that’s it, An act of true love which makes me feel loved every. single. day! I’d love to share some tips which have helped me. Clean up whenever you are done for the day. Put things back where they belong, Tidy up your workspace, even if it means neatly stacking things. This way whenever you are ready to come back in, you’ll feel inspired. 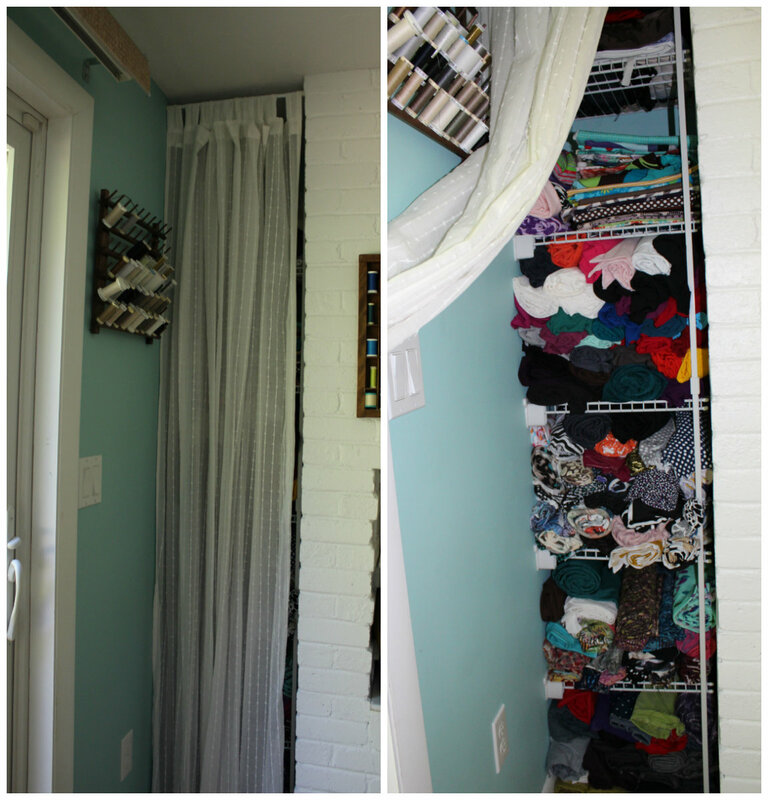 Use the walls for vertical storage. Bookshelves are great for storing more than just books and magazines. 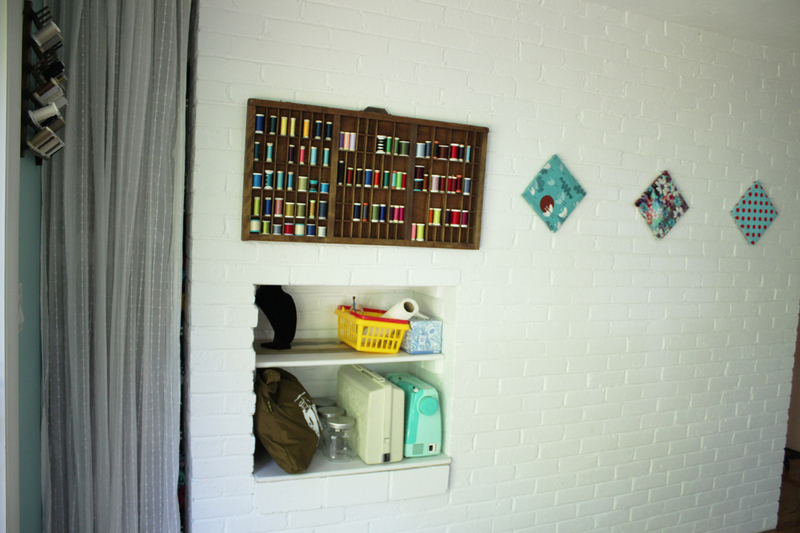 Some people like to use pegboards to store notions. Make sure your cutting surface is the right height for you. If it isn’t use bed risers to adjust. Trust me, cutting on the floor is not a good idea. Really bad for the back. Before I had this room, I used my kitchen island to do all my cutting because it was the perfect height for me. 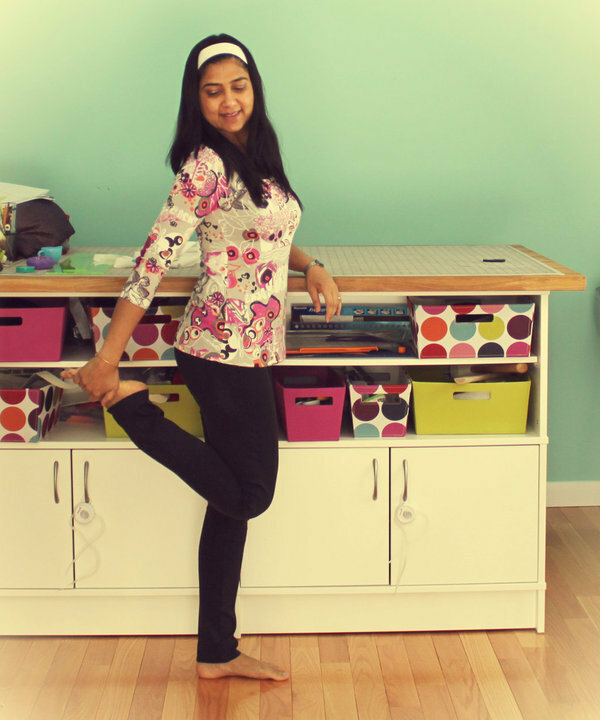 Go into your sewing space at-least once a day even if its for 10 minutes. 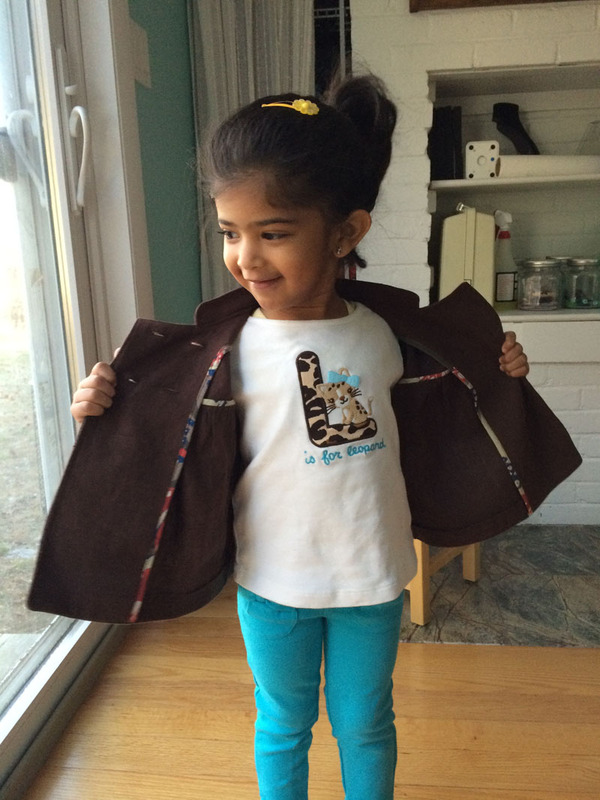 It will make you smile and maybe you can even sew a seam or two. Don’t be under any pressure to crank garments out. 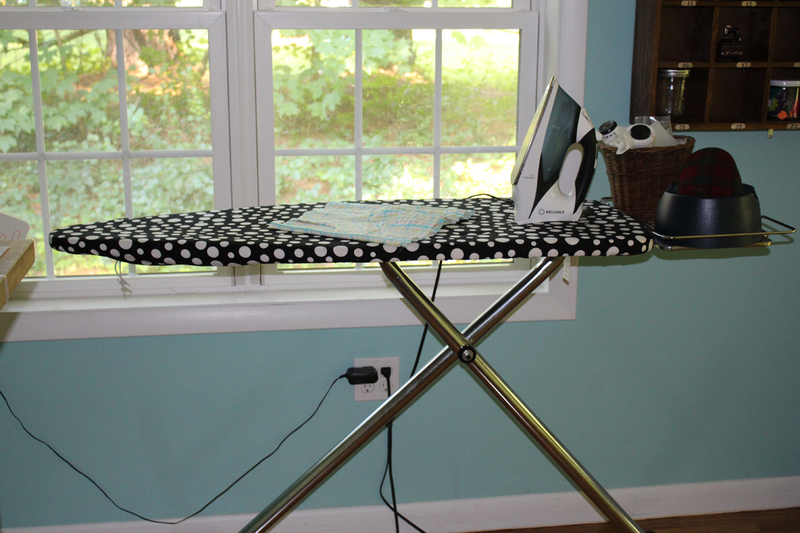 If you don’t have a dedicated sewing space, make the most of whatever you have. 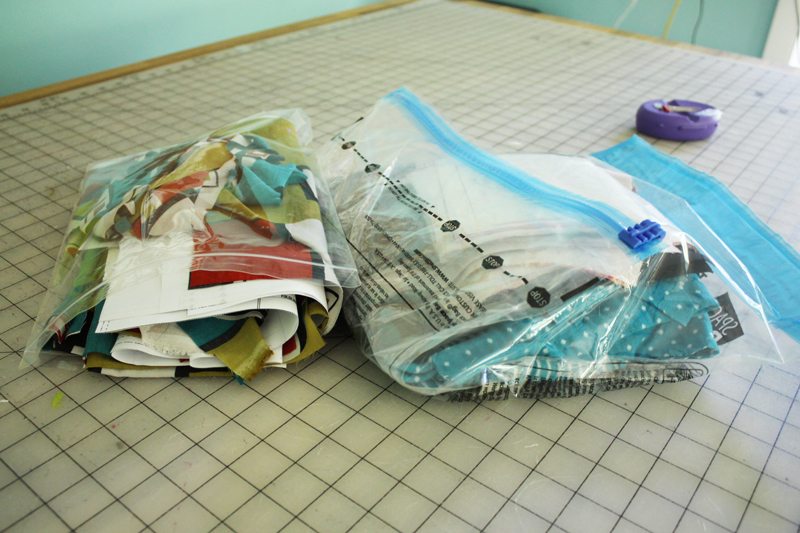 I used to schedule cutting sprees on my kitchen island then keep them in separate plastic bags so I am ready to go whenever I have time to sew. Most important – Take it slow. Remember “Rome wasn’t built in a day“. 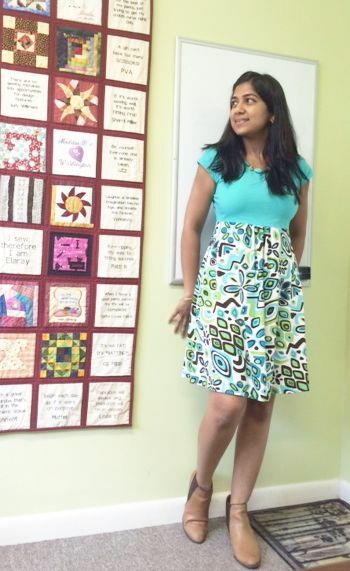 Thanks for walking along with me in my sewing room tour. 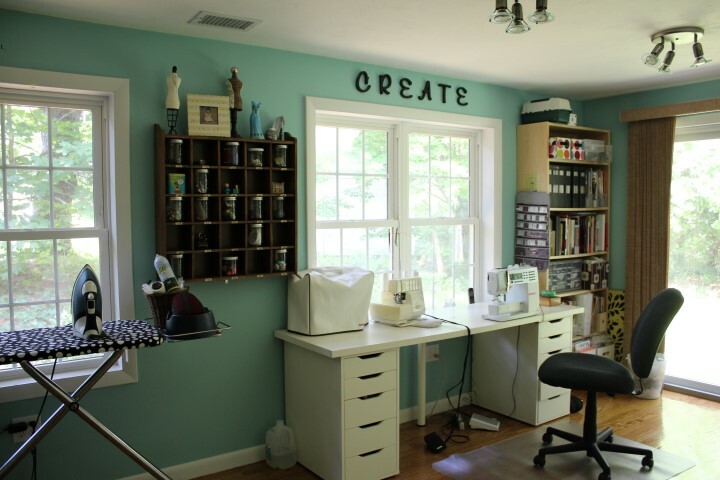 Whether its a shared space or a dedicated studio, or even a table in the corner of a room, I hope you get joy from your sewing space. Dia and I have spent so many wonderful moments in this room and hope to continue to do so for a very long time. 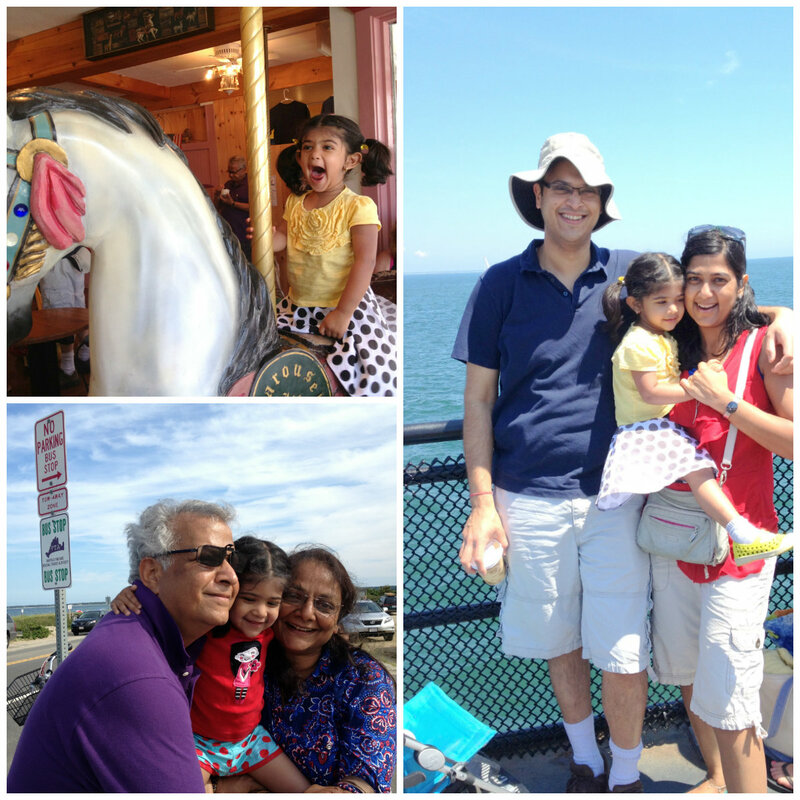 I realize this is the most narcissistic post (can you stand to look at so many photos… ARGH I can’t.) I’ve ever written, but it needs to be documented so here I am, doing it. 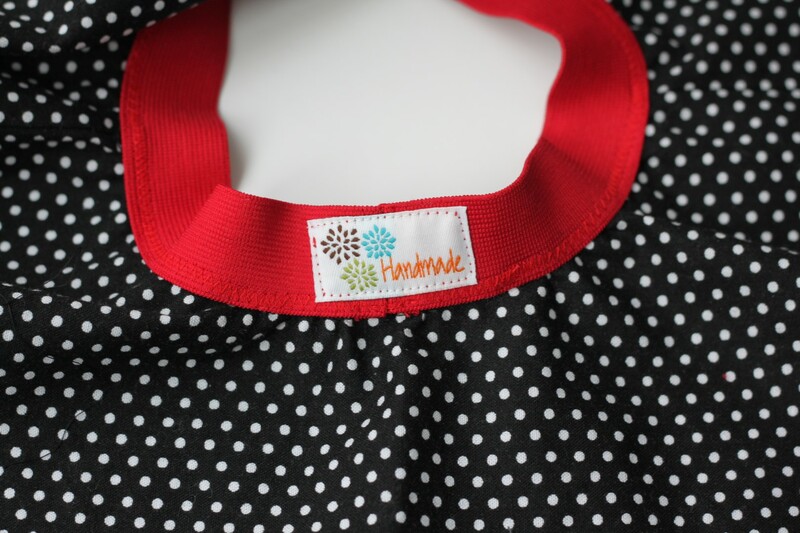 So Me – Made – May, is about wearing something handmade every day and and loving it. It is really not an effort for me because most of the clothes I wear are me-made anyway but I’ve taken it upon myself to not repeat an outfit. So I am digging out things I have not worn in a while and its kinda cool. 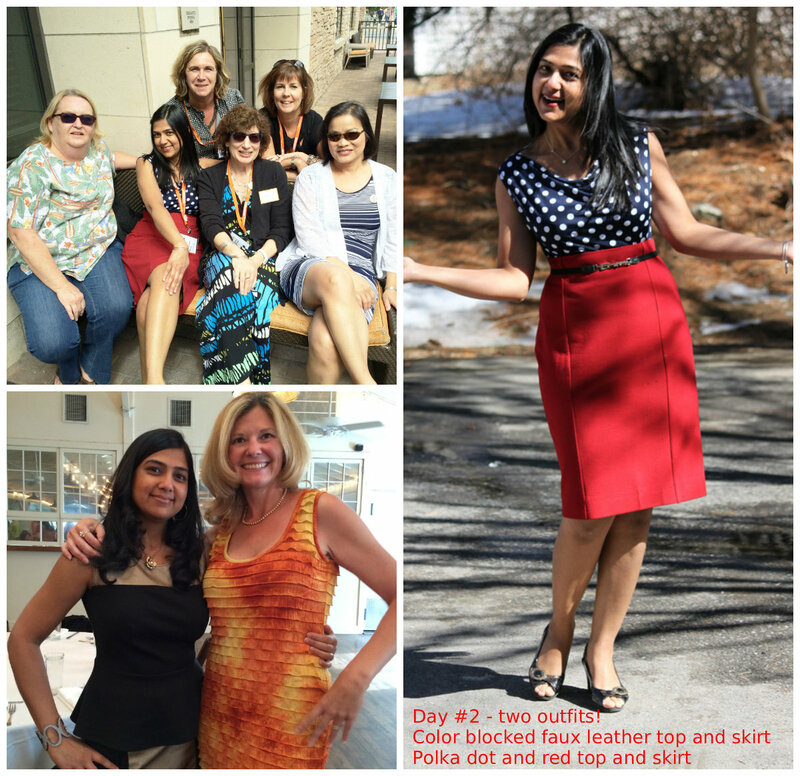 We’re half way there and its starting to bother me a little bit because I am wanting to wear some of my favorite RTW pieces but I am going to stick it out 🙂 Here’s what I wore last couple weeks. 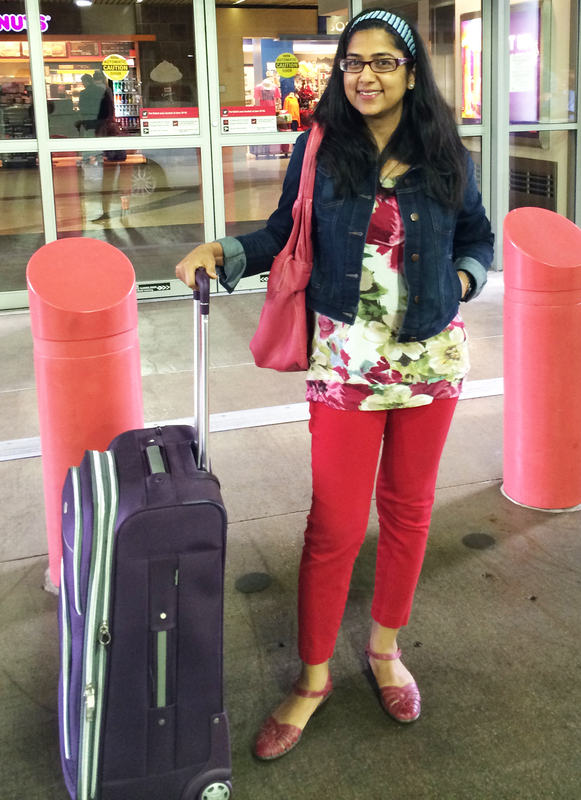 I was on my way to the airport (what a nightmare of a flight!) for PR Weekend. Wore RTW pants and Jacket with Oversized Olivia T-Shirt. Perfect travel outfit. All about PatternReview. The dress, the event.. everything! 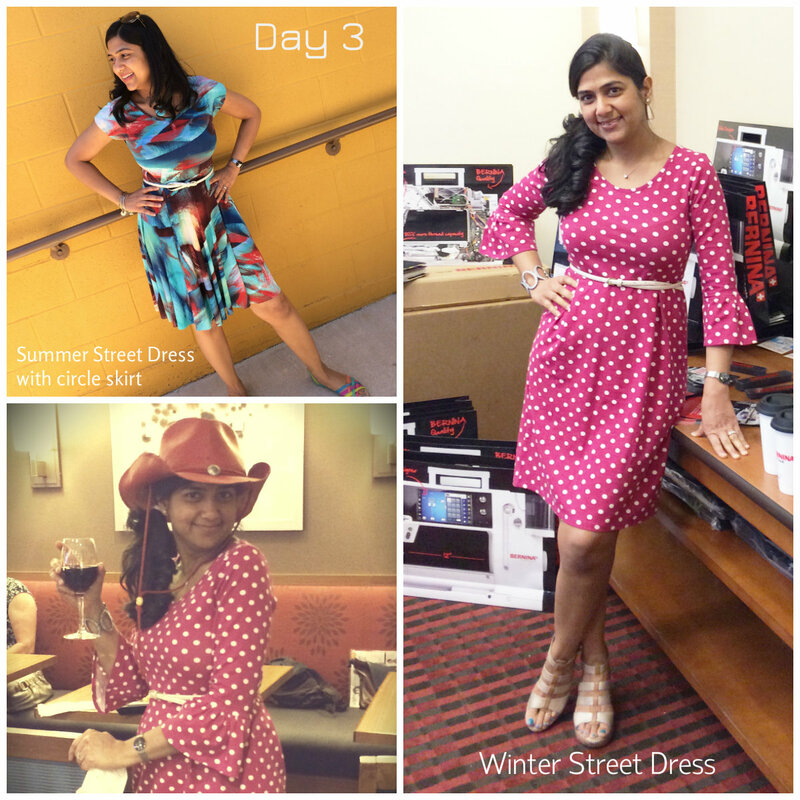 In the Morning for shopping day I wore Summer Street Dress bodice with a circle skirt attached (no review yet) and in the evening for cocktails I wore The Winter Street Dress. Back home on the plane from Austin. I didn’t get to take a photo (too tired) but I wore Plantain top with RTW pants. Missed taking a photo again! So cold back here in MA! 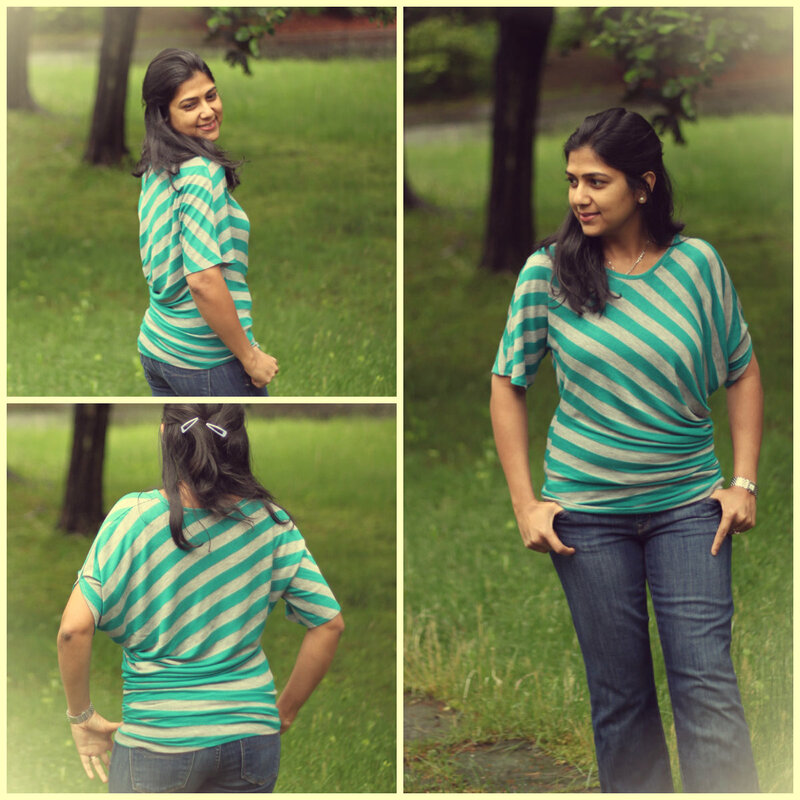 Perfect for my Drape Drape Top. I dug out the first Summer Street Dress. I didn’t wear it all winter because I don’t have tights which work with this. But yay for warm weather. Loved it. I really should wear this more often. BTW I got tired to ask Gagan to take photos so I installed this fantastic app called TimerCam on my phone and it works like a charm! Still so cold here but at-least I can go without wearing tights now. 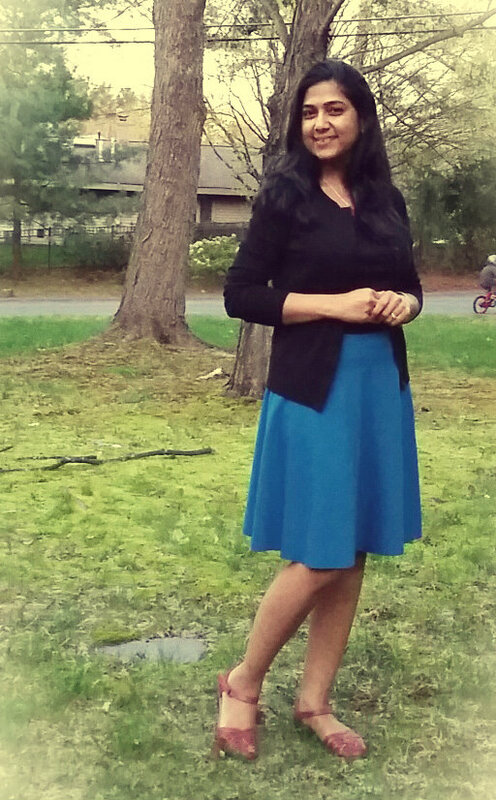 This is a self drafted half circle skirt from a gorgeous blue ponte knit. Love it! RTW tank and cardigan (Loft). This is hands down the most worn garment in my wardrobe. 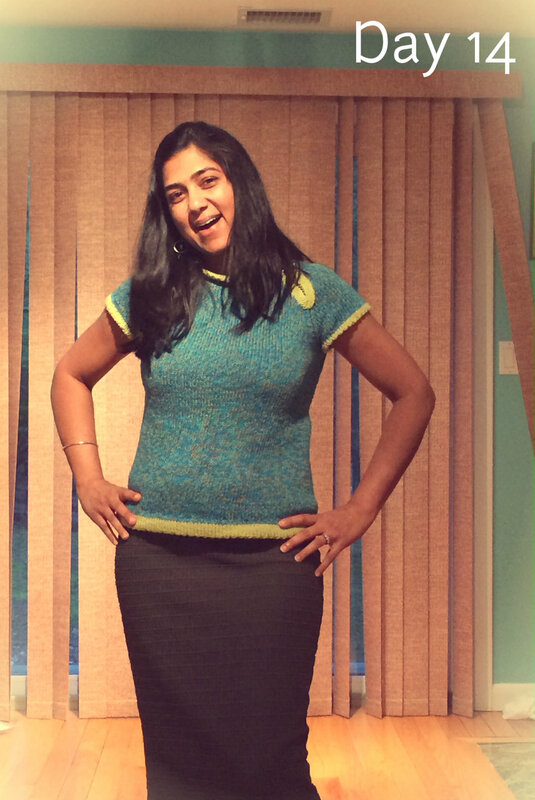 Its the same Summer Street Dress pattern ( I can’t help it, it fits me so well) in ITY knit. Reviewed here. 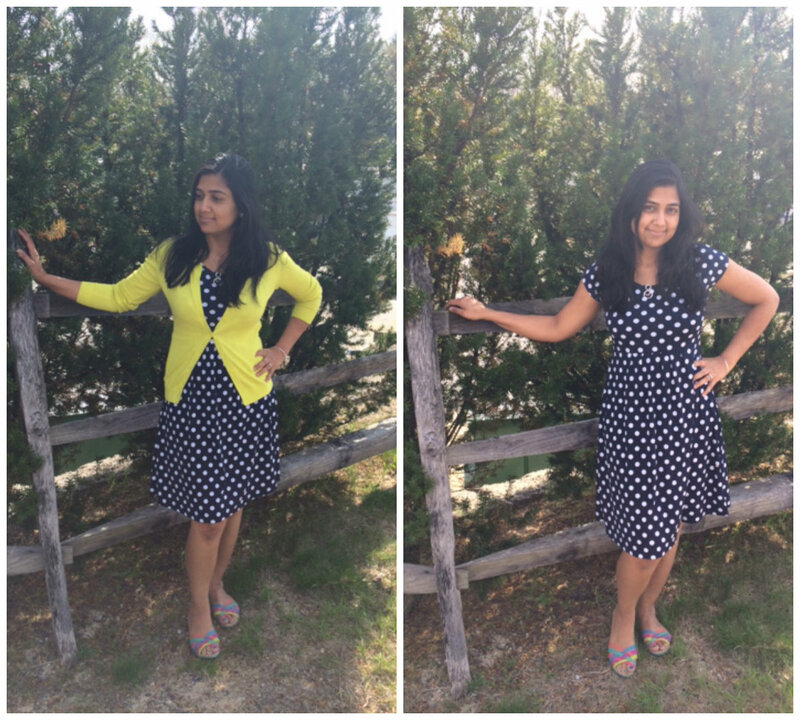 The yellow/green cardigan looks a little too bright in the photo but in real life it goes well with this dress. I totally don’t remember what I wore this day, but I do know it was me-made. Mother’s Day. What a glorious day we had. 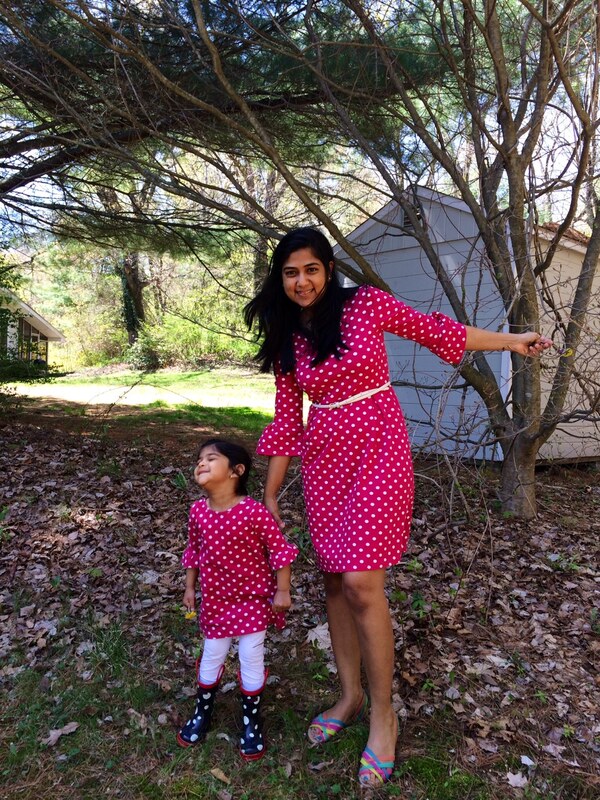 In honor of Mother’s Day, I dressed myself and Dia in matching dress. Some may call it creepy, but I call it cute. 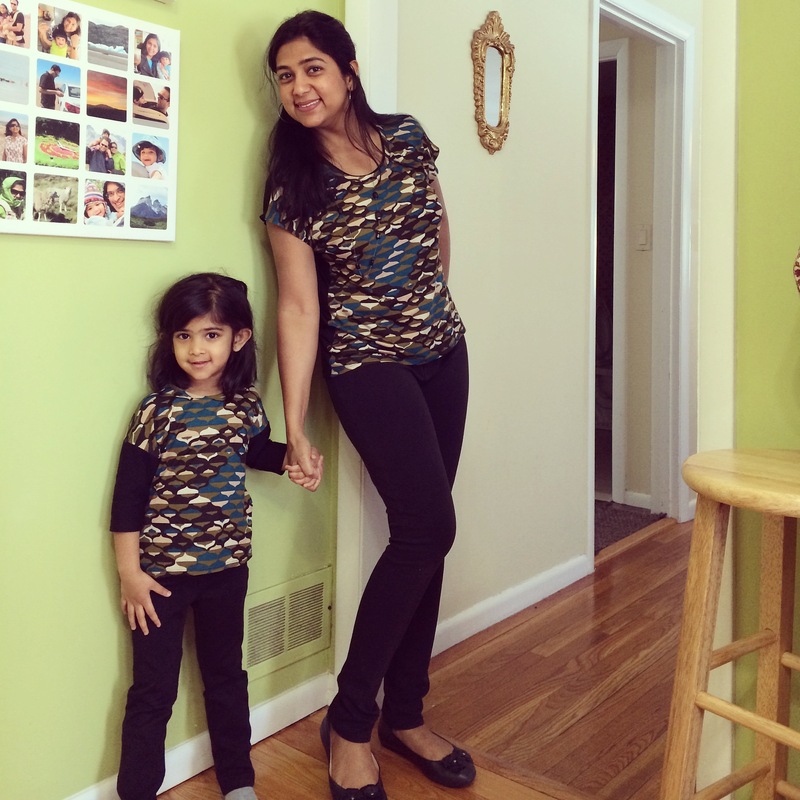 I dont know if I have the courage to go out in matching outfit though. But here we go. Winter Street Dress for me and Anywhere Dress for Dia. Monday Blahs…. Forgot to take a photo, but this is the outfit. (Ugh.. I hate my hair, and what’s up with headless photo?). 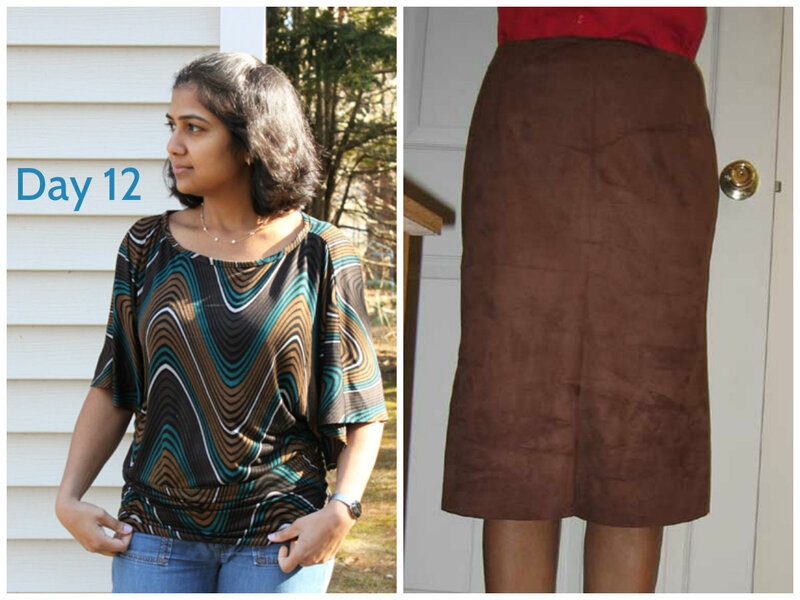 New Look Top and Burda Skirt. Ok I feel like myself again. I usually don’t wear white tops, but I love my lace plantain. RTW Pants. Tired of looking at me yet? I am! One last photo and I’ll let you go. I dug this one out. I love this top. Only took me a year to knit this. Its a freaking t-shirt! I can sew one up in 45 minutes but I still love it. Later that day, I found this in hot laundry pile. Now I either need to shed a few lbs or wear a super tight split neck tee. Don’t wanna talk about it… too depressed. Skirt is Boot skirt I made ages ago, but still love it. Why haven’t I made this again? I have no idea. See you next week when I do another round up and we’ll see if I stuck it out or not. and this year I am super excited about Me Made May! 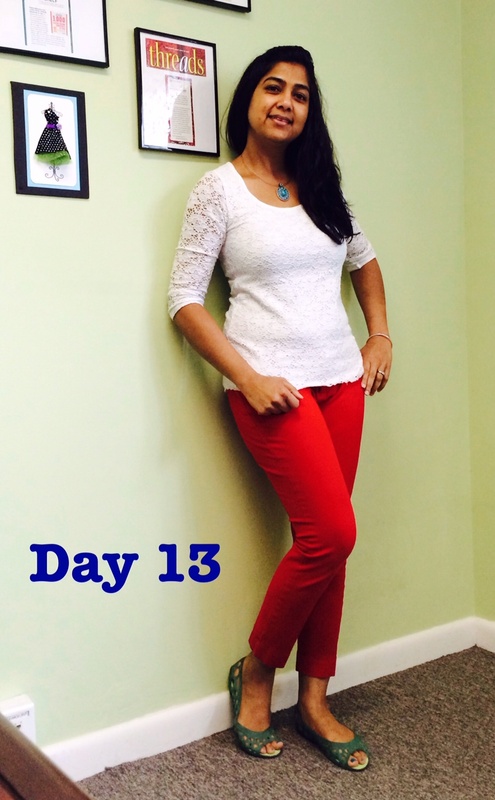 I’ve seen the excitement over the years in the blogosphere and this year I am taking the pledge! No, this is not for my cutie, and Yes, this is my second post in a week on my blog which has been feeling a little neglected lately. Nothing like party planning to bring you out of your blogging rut right? 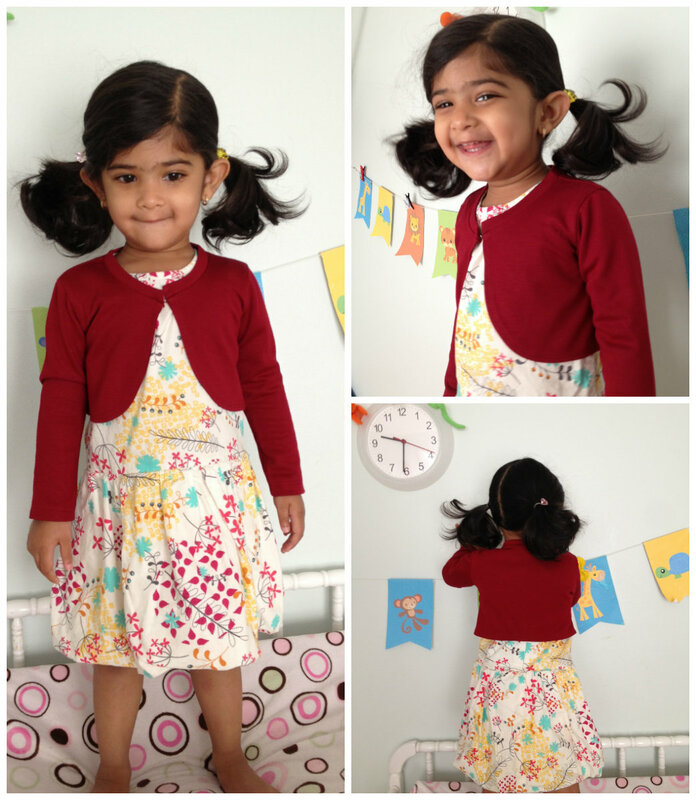 Anyway, since I am sewing a lot for kids and it is after all Kids Clothes Week, I decided why the heck not! 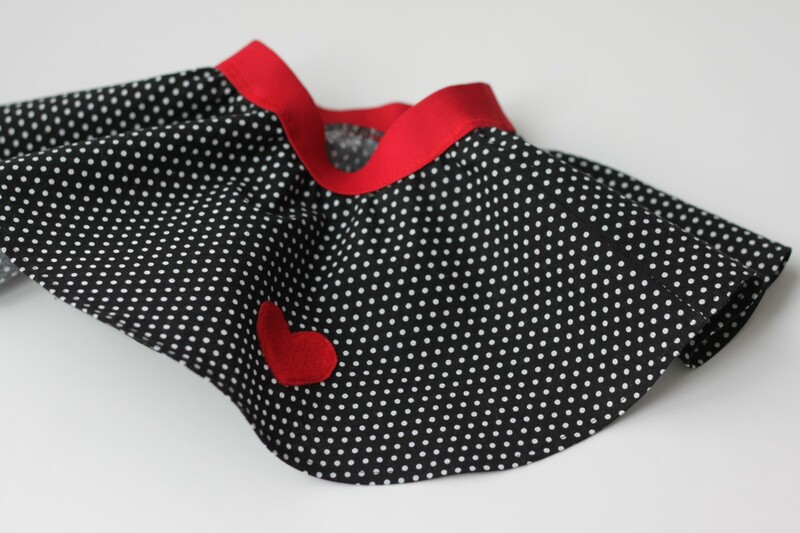 This cute valentine’s day inspired skirt is for a 4 month old cutie pie. 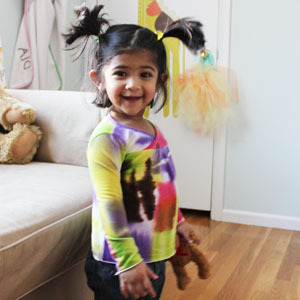 My friend’s daughter… She is precious I tell you and primary colors look good on her. Actually any color looks good on her. 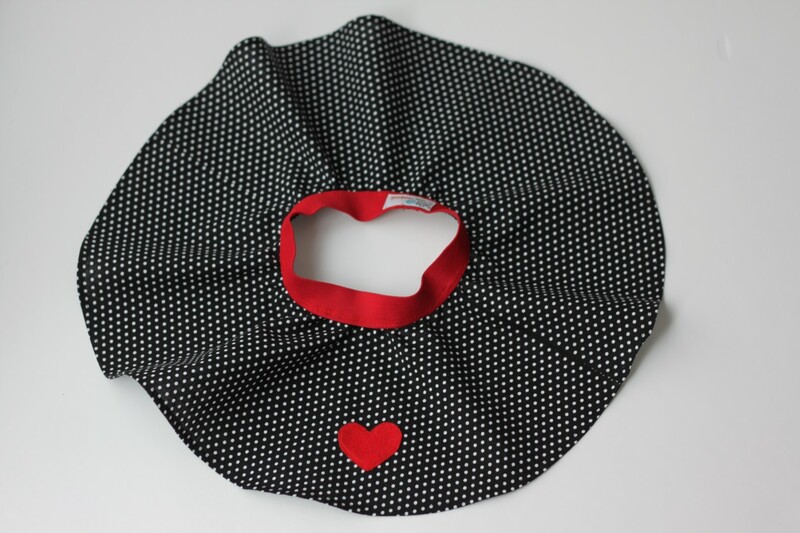 And since I am a polka dot fan and I had this fabric in my stash, I decided to make a quick circle skirt for her. I used the free pattern Dana provides here. 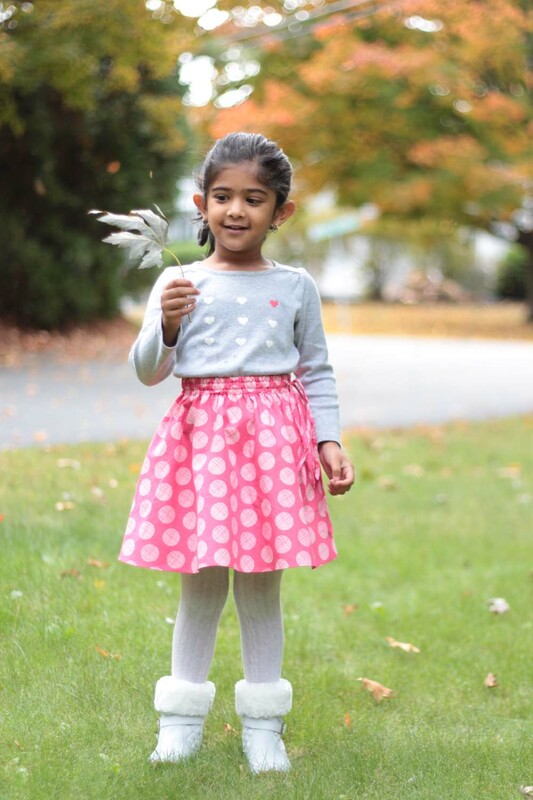 I’ve made this skirt half a dozen times before but never for such a small girl. She is only 4 months old! I can’t wait to see this on her. 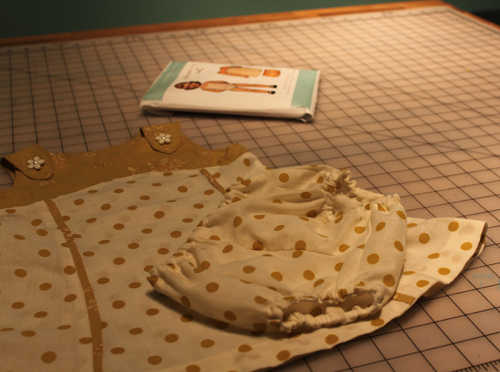 The whole sewing took me one evening and it was so enjoyable. Valentine’s day is coming up so I decided to add a little something special for the baby. I know I know, I must be going soft in my old age. I never used to believe in any valentine’s C.R.A.P. (yes we’re so used to spelling bad words now, half the time its not even worth saying them anymore). 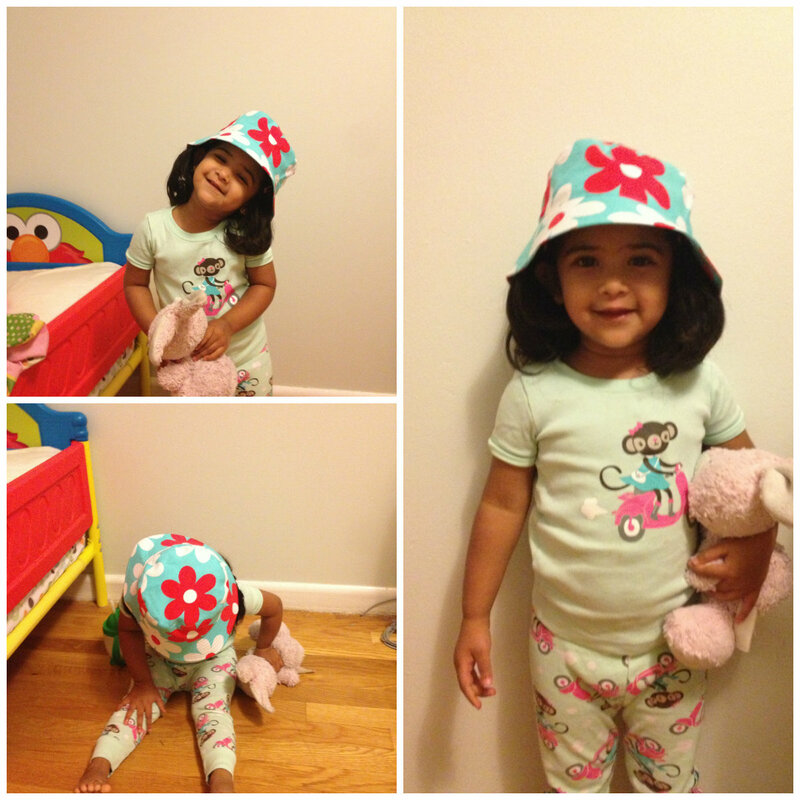 Having a 3 year old in the house is cramping my style! I’ve never done applique before but I had felt lying around from making a head bands for Dia, so I figured why not. And I think it turned out so darn cute. 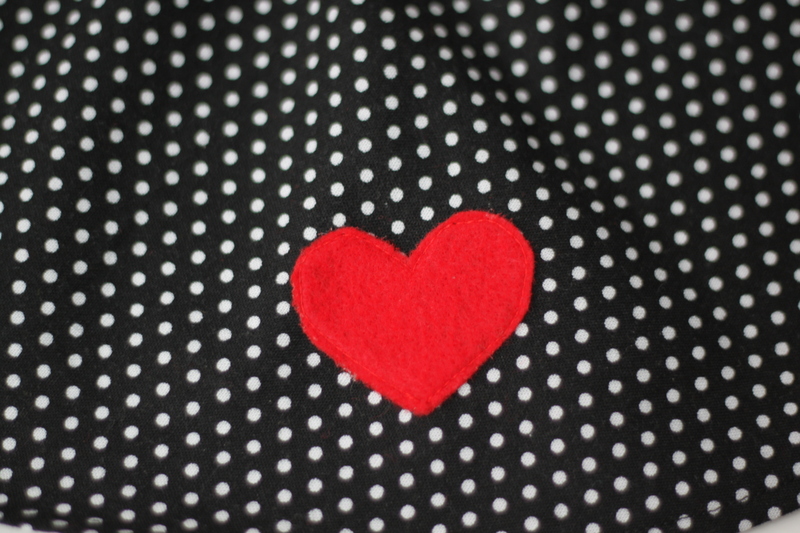 I sprayed the heart with temporary adhesive to stick it to the skirt and then carefully and slowly sewed it on. Since felt doesn’t fray, a simple straight stitch was all that it needed. I have no idea how craft felt does in the washing machine, but its very easy to just rip out the heart if it doesn’t work out. I just had to do it. 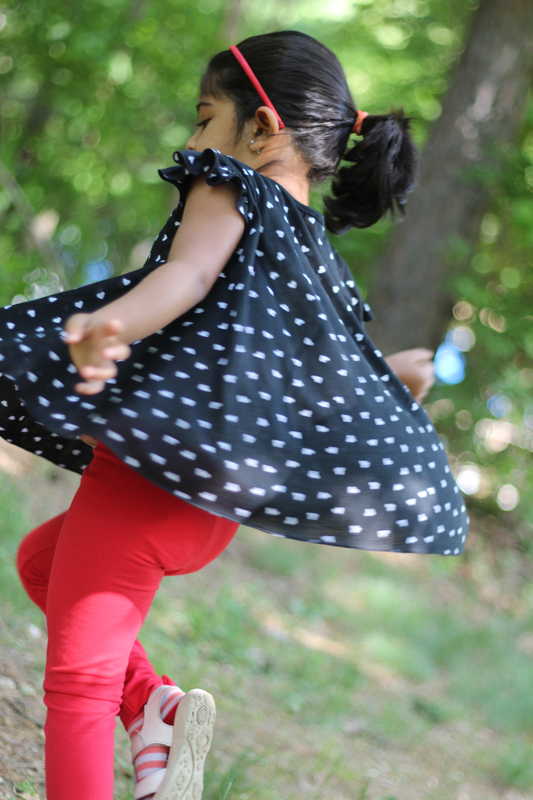 It just love the black polka dot and red combo. I was lucky enough to find this red elastic at Joann’s the other day. Also added a label in the back, just like Dana does. It also tells the front apart from the back. As if the red heart wasn’t a dead giveaway. I am meeting the cutie’s mom for tea this Sunday, I am so excited to give this to her. I know she will love it. I just hope it fits the baby girl. I bought a red onesie and made a matching felt headband too. I think the baby is ready to celebrate her first Valentine’s day. Don’t you? 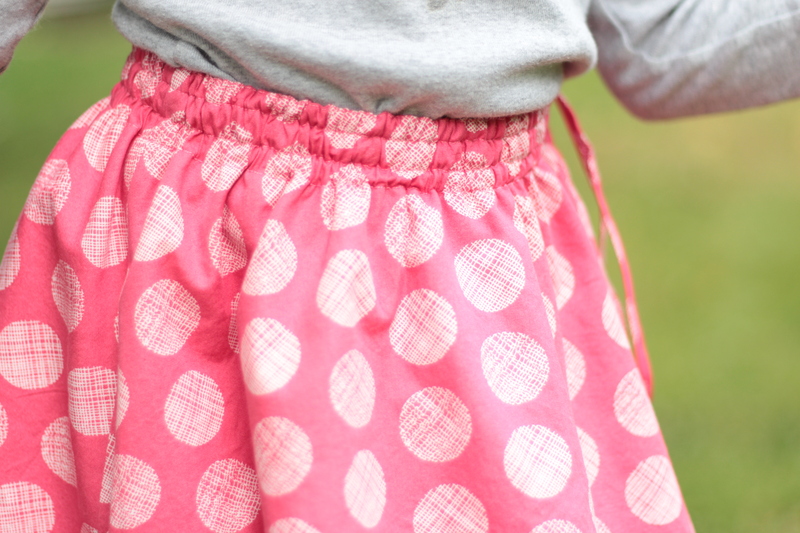 A new pattern company – ooh la la! Just before we were about to leave for Martha’s Vineyard, I received a package containing two new patterns which I’d been lusting after for a long time! And pretty they sure are! I ordered the Belladone Dress because I love the back cut out and streamlined skirt of the dress and the Blouse Datura. 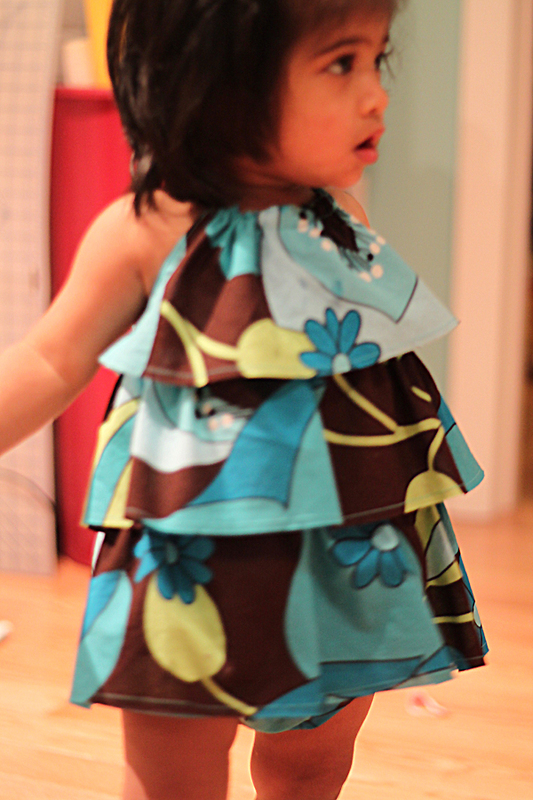 I can see myself using up a lot of the cottons I have left over from making things for Dia. I didn’t blog about it but last year we went to Paris and what can I say. I am in LOVE! I love all things french now 🙂 Ok back to Deer & Doe. 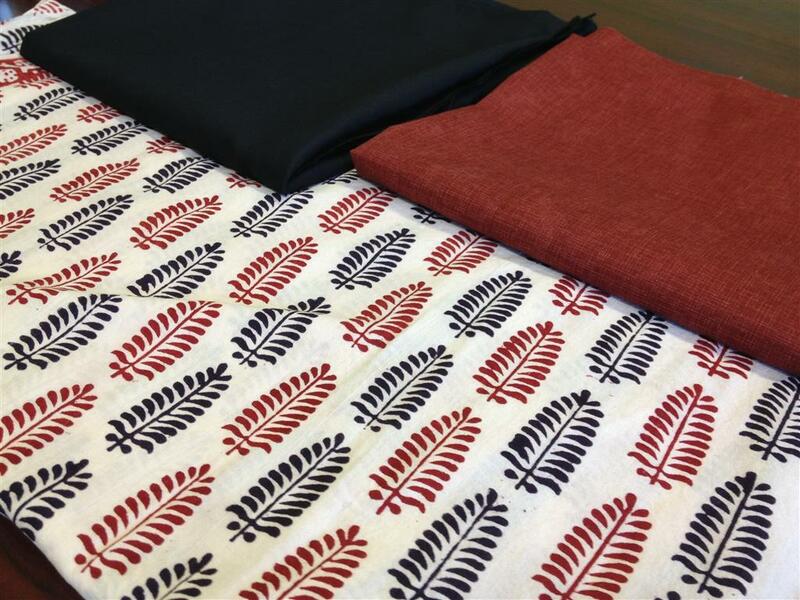 So last night I traced off Datura and I even have the perfect fabric for it. I got this hand block printed fabric (all vegetable dyes! ) 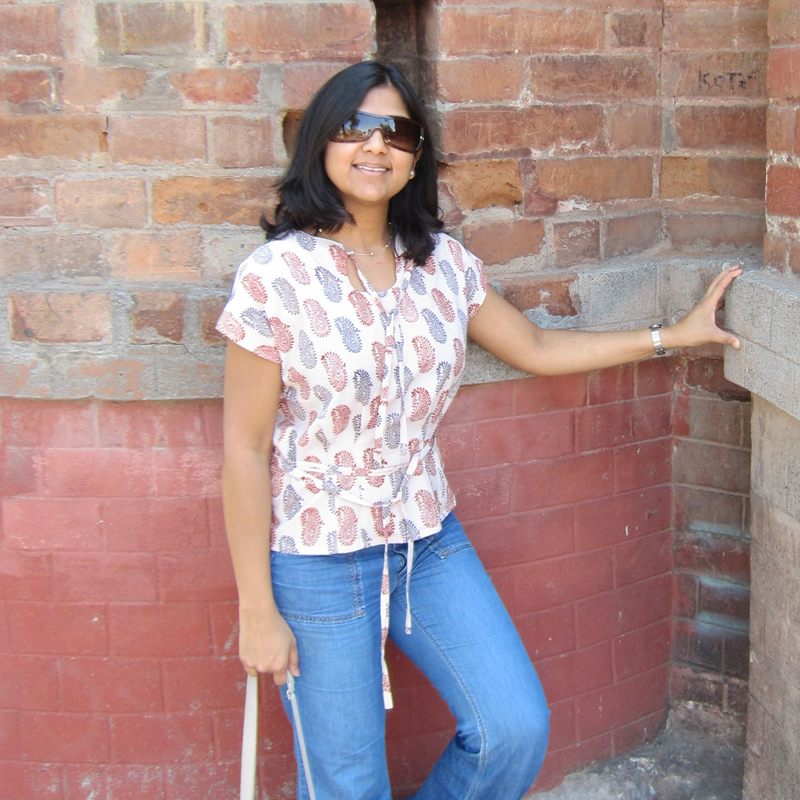 from India years ago. It’s the softest cotton ever. I have used a similar fabric in this top and I wear it all.the.time. I picked up these two basic cottons. Actually the maroon is quite cool with a slight tone on tone print. 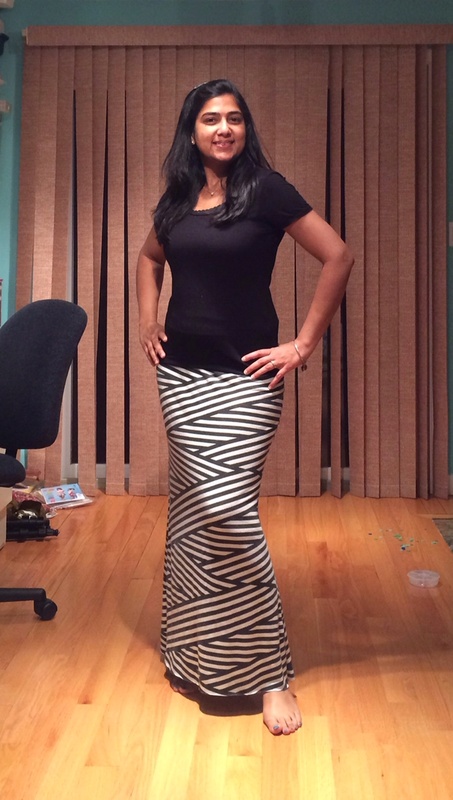 Donna, at the store was super helpful and I was able to find just the right fabrics. Most of my fabric still comes from online stores but I sure am grateful for Quilter’s Way. The quilting manufacturers have actually started making really nice apparel quality fabrics and the prints are breathtaking. I’ve been using quite a few for Dia and starting to use for my clothing as well. Here are some photos I took there. I’ll write a full review on PatternReview soon too. 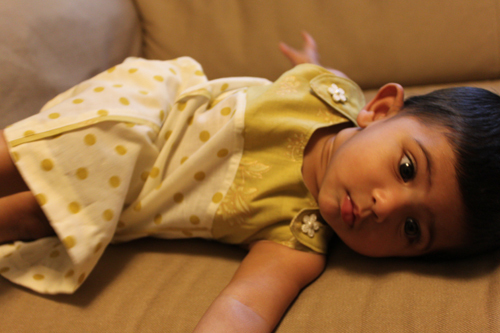 Aren’t you dying for those polka dots? I AM!